We arrived in Cottondale on June 22, 2016. The drive was a little longer than normal, just over four hours. We stayed at the Hitchin' Post Corral and Campground RV Park. 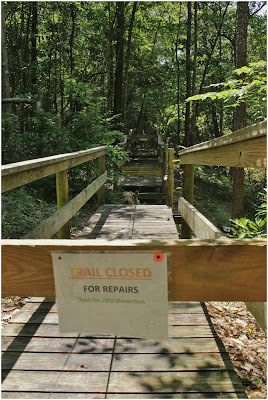 It is a fairly new campground, so they are still doing a lot of work on it. It is along side I-10 so there is some road noise in the back of the camp. We were nestled under some trees in the front of the camp so the noise wasn't bad. We had a pull through site with full hook ups, a picnic table and a fire pit full of fire wood. Unfortunately it was much to hot to sit outside around a fire. There are two fenced dog areas, horse corrals, and a nice field with a badminton net, ladder-ball, corn hole, bocce balls and Frisbees. The park is lined with blackberry bushes and flowers, plus the owners brought us fresh eggs from their chickens. We paid $27.00 a night with our Passport America discount. The owners are super friendly and we hope the best for them. We got to spend some time with more family. Nancy's 2nd cousin, Taimie, and her family from Georgia were in Panama Beach. Her son Jet was playing in a baseball tournament - his team took 3rd place. Ya-Hoo! Nancy's great-niece, Lilly from Louisville was with them as well. They were staying at the Sunrise Beach Condo's, right on the Gulf of Mexico. Beautiful view that we all decided we would love to see everyday. It was so great spending the afternoon with them. 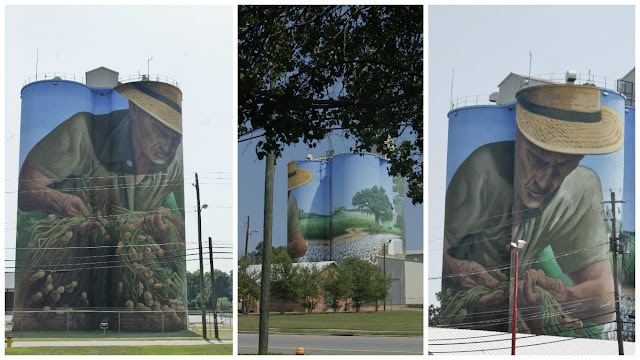 Colquit, GA is about 45 minutes north of Cottondale and also home to the Georgia Peter Wolf Toth Indian. So of course we went there. The Indian sits in front of the Chamber of Commerce. 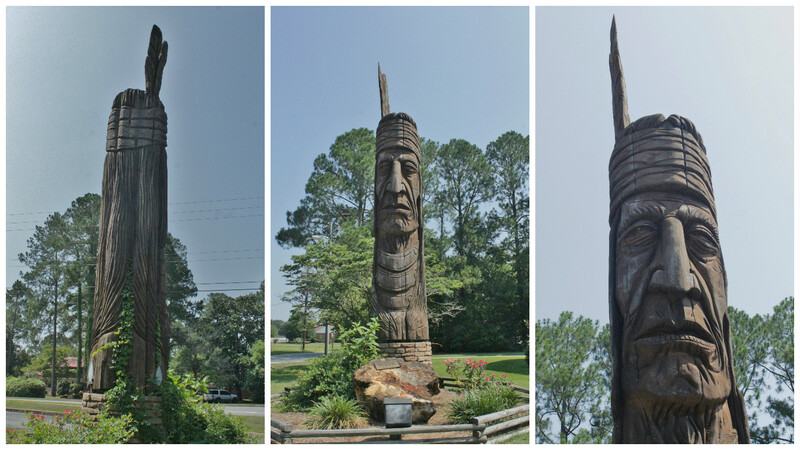 This is a replacement statue, the original one, carved in 1973, was the 4th on the Trail of the Whispering Giants and was damaged. 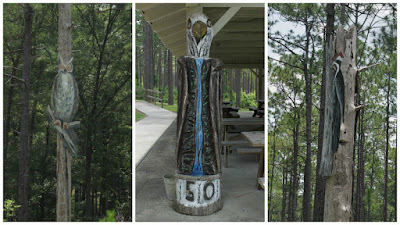 This one is the 70th on the trail and was carved out of oak and is 18 feet tall, there is no name recorded for it. A few blocks over from the Indian is an amazing peanut silo. The entire 27,000 square feet of the silo is covered in a painted mural of agricultural images of cotton, corn and peanuts to name a few, and a farmer inspecting peanuts to decide if it is time to harvest. The artist, Charlie Johnston is from Winnipeg Canada. It is so beautiful and what a task it must have been to paint it, Nancy has painted a number of murals in her time but never a 27,000 sq. foot one that is 100-feet tall! 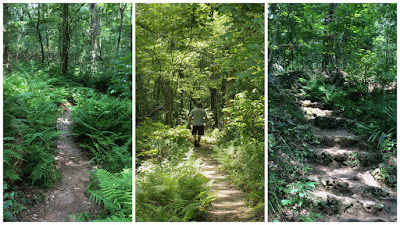 Even though the temperature was 90º with a real feel of 106º we ventured out to two State Parks in the area to do a little hiking. 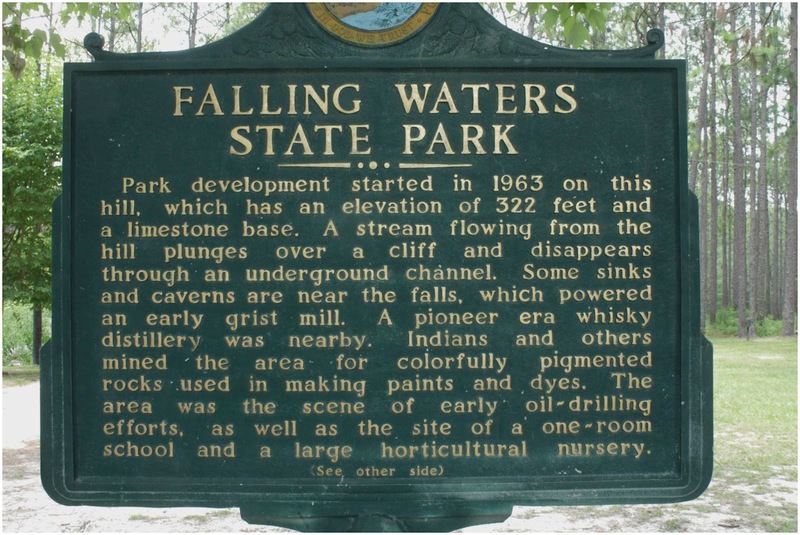 First up was Falling Waters State Park, where you can find the tallest waterfall in Florida, or at least you can when the water is running. 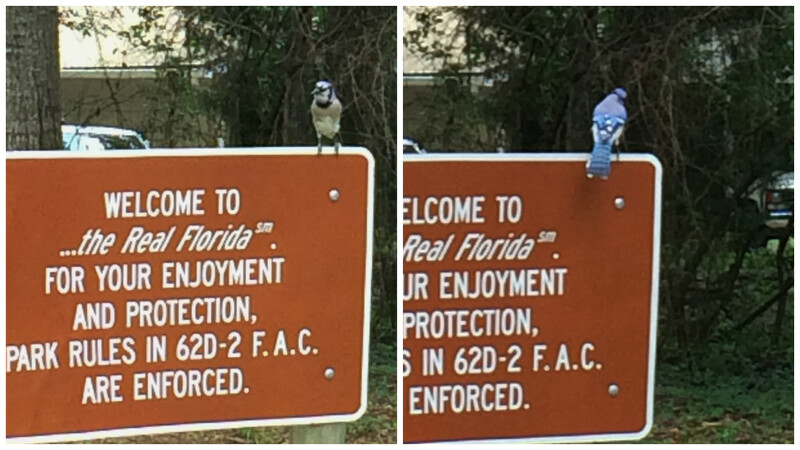 On the entrance road are two painted wooden cut-outs of birds in the trees, kinda neat. 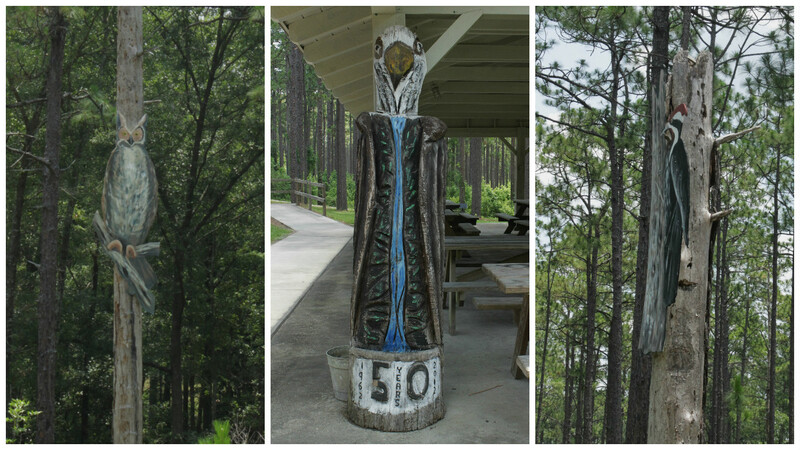 At the picnic pavilion you will find a large carved eagle, in honor of the 50th anniversary of the park. This time of the year the 73-foot waterfall is just a trickle, or as the Ranger said, the falls are sweating! You can barely see the water flow in person, let alone in a photo. 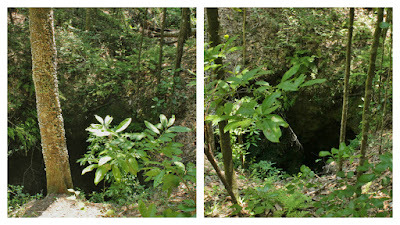 The falls drop into a limestone sinkhole that is at least 100 feet deep. 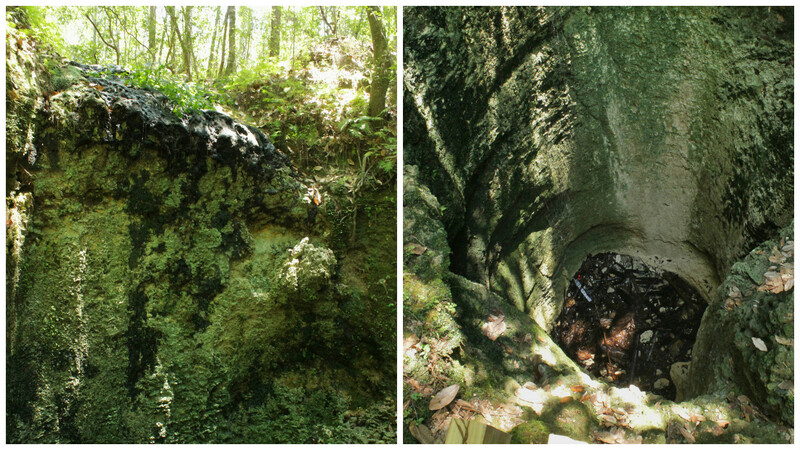 It was still very pretty, and the trail takes you past a number of sinkholes. Sinkholes form when the roof of an underground cavern collapses. The age of the sinkholes in this park are unknown, but it is believed to have been an ongoing process for thousands of years. Many of the sinkholes are over 100 feet deep and some they have no idea how deep they really are. 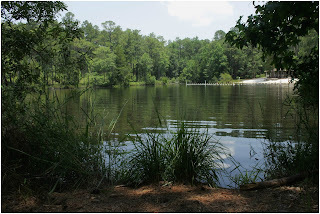 At the end of the trail is a lake with a beach and a small area roped off for swimming. Based on the sign next to the beach area, we don't think we would venture in. Although there were a lot of people swimming while we were there. There are two spots on the trail where you will find posts with instructions on taking photos in a 360-degree spread and one looking up. What a cool idea. It's a project from the University of New Hampshire, which makes it even cooler, as our daughter Katrina received her Master's Degree from there. When you click on the link you will find pictures and also a link to a map that shows where all of them are across the country. 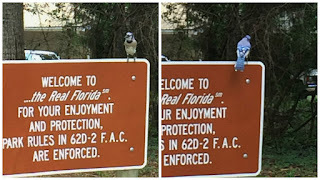 After taking the photos you upload them to to the Picture Post section of their website. 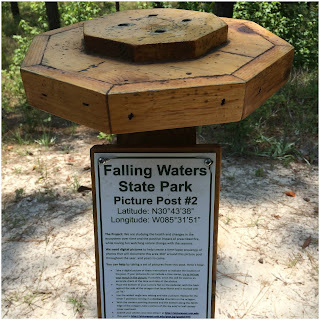 Picture Post #1 is at the water fall and Picture Post #2 is by the lake. 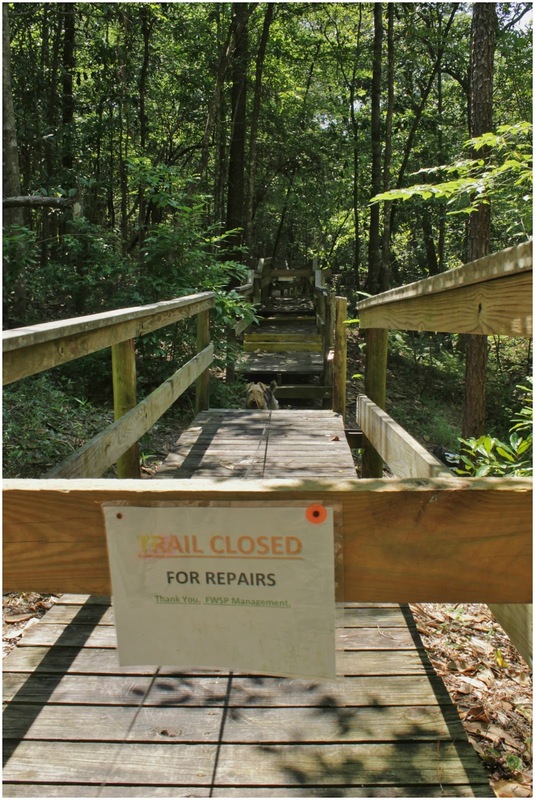 One section of the trail is closed for repairs but Mielikki was not reading well that day and wanted to go in that direction. She sat down in the missing section of the walkway and wouldn't budge! As usual Nancy found lots of interesting things to get pictures of. Gypsy Moths, flowers and mushrooms. This area was once thought to have oil in the ground. In 1919 a serious effort was made to find oil here. Jose Mantanza sparked the interest of oil wildcatters with stories of rock-enclosed substances that would burn. So in the midst of a beautiful piece of earth the Wildcatters began to erect a drilling sight on an apparent earth fault (Words from a sign at the site). A wooden derrick and steam driven rigs were used for drilling. They had little luck finding oil. When they reached 3,900-feet a blow of gas was released from the drill site. The excitement over finding a gusher was temporary. 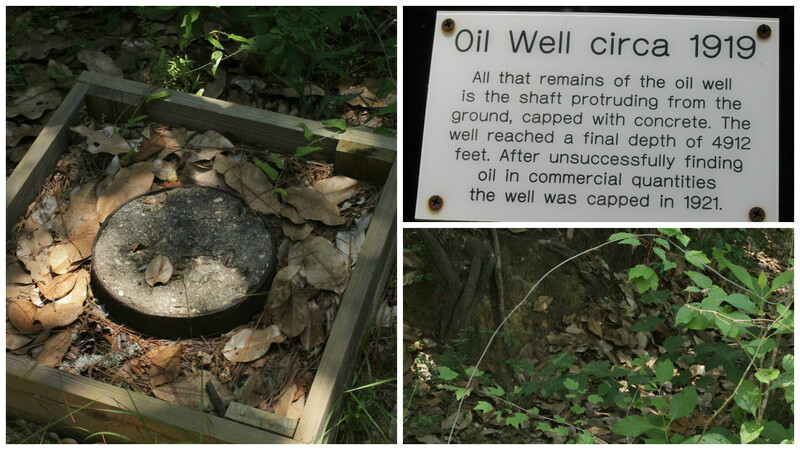 After drilling to 4,912-feet and no oil was found, the operation was shut down in 1921 and the well was capped off. 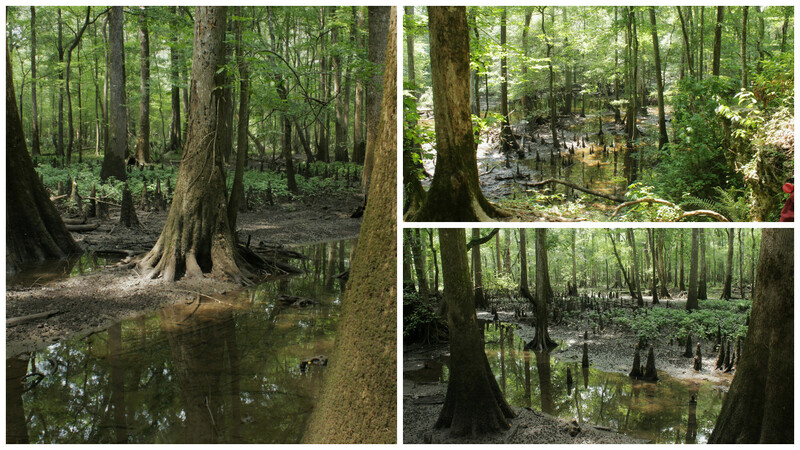 In the bottom left picture is a large ditch that one might think is a sinkhole, but it is the remains of the Sludge Pit where the by-products of the oil drilling were dumped and then found their way to the stream that feeds the water fall, which of course runs into the aqua-filter! Been destroying mother nature for years. 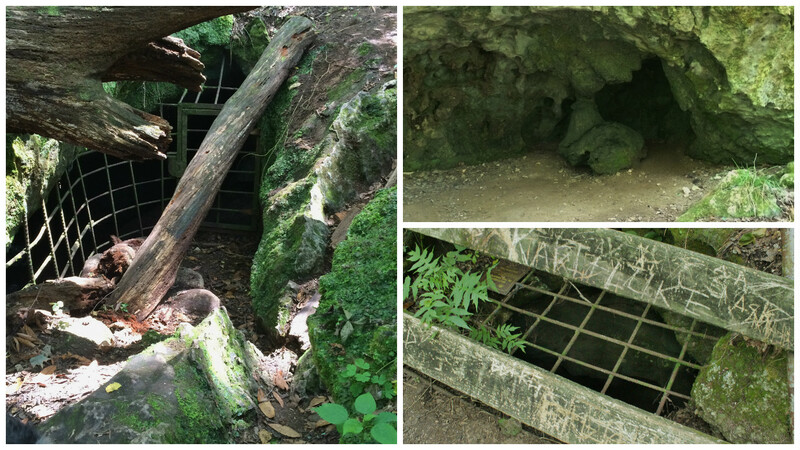 Second hike of the day was at the Florida Cavern's State Park. 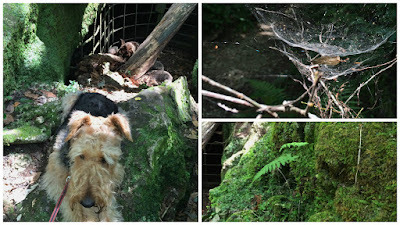 You can actually tour the caverns, but with the dog in tow that was not possible for us. 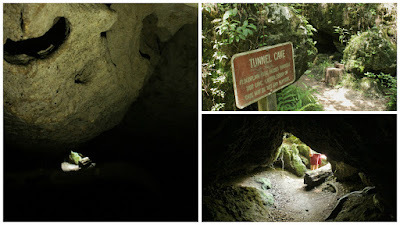 Based on evidence that has been found in one of the caves a group of Indians lived here about 1100 years ago. The bones and shells indicate that their food consisted of wild animals and fish. In the 1500's this was also the site of an Indian Village, and based on the broken pottery and spear points these Indians were farmers and hunters. We really don't want to think about what future generations will think about us based on what they will find! On the walkway to the Visitor Center and Gift Shop is a CCC Monument. This park was part of the CCC program. 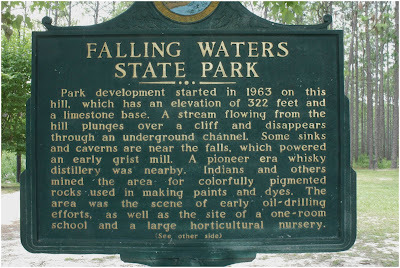 There are so many parks and other attractions that we enjoy today due to the work of the CCC's. 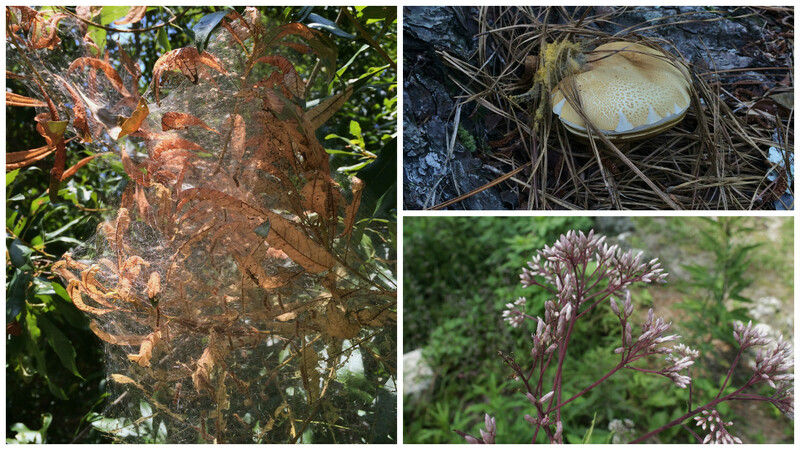 We also enjoyed a little bit of beautiful nature. 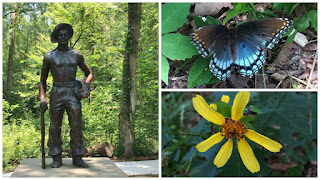 The hiking trail was pretty interesting, the trail is a long arch to and from the Visitor Center, with two short cut trails at different intervals. It is lined with caves large and small. 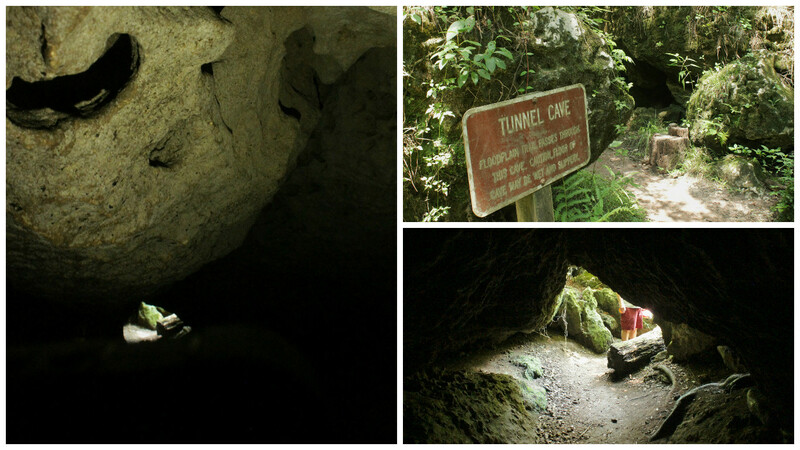 One of the caves is actually a tunnel you can walk through. It has a very low clearance and we both bumped our heads, with Les getting a nice cut on his forehead. 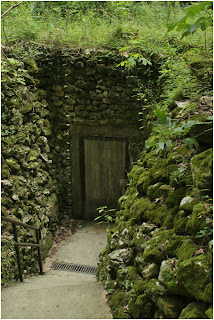 There are also grated openings to the caverns. Great access for bats. You could feel the cool air from the cavern coming out of the opening in the picture on the left. Mielikki found it to be a nice place to rest. There was lots of lovely green moss and very interesting spiderwebs. makes us think of Ireland. 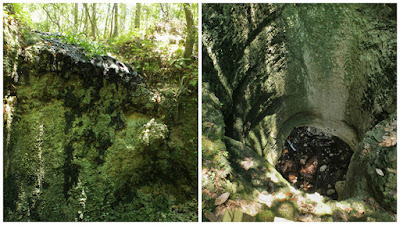 The trail for the most part was pretty rocky and full of tree roots, and in places almost lost to the ferns, which added to the enchantment. 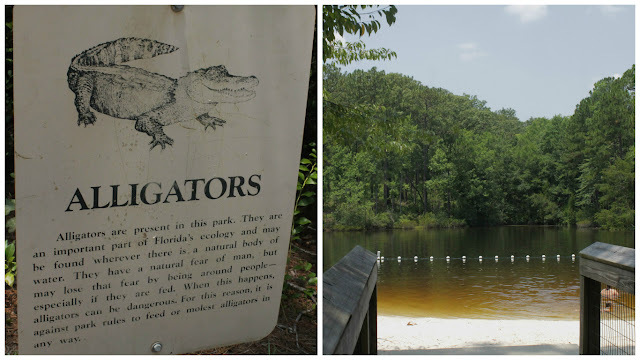 One section takes you through the flood plains that look like they would be the perfect home to alligators. 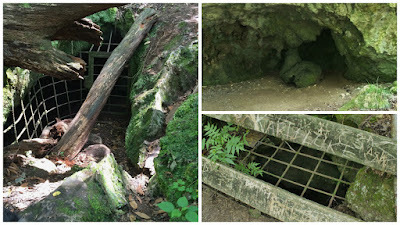 The park's caves have a long history. At one time, sea levels were much higher than today, the southeastern coastal plain was submerged. Shells, coral and sediments gradually accumulated on the sea floor. 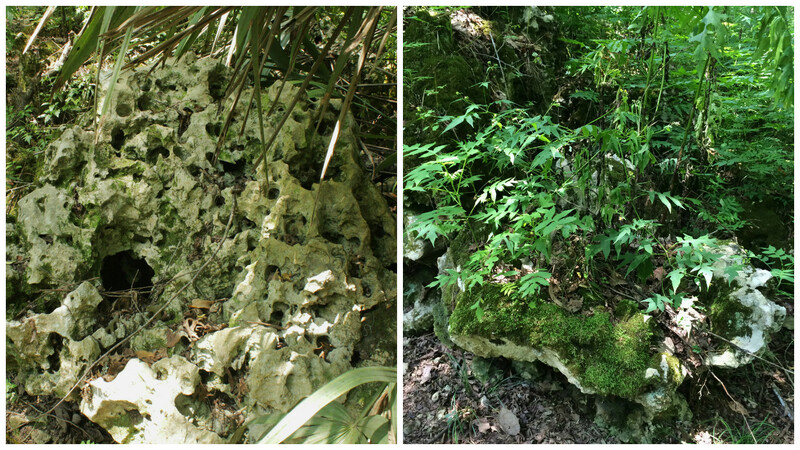 As the sea levels fell, these materials hardened into limestone. 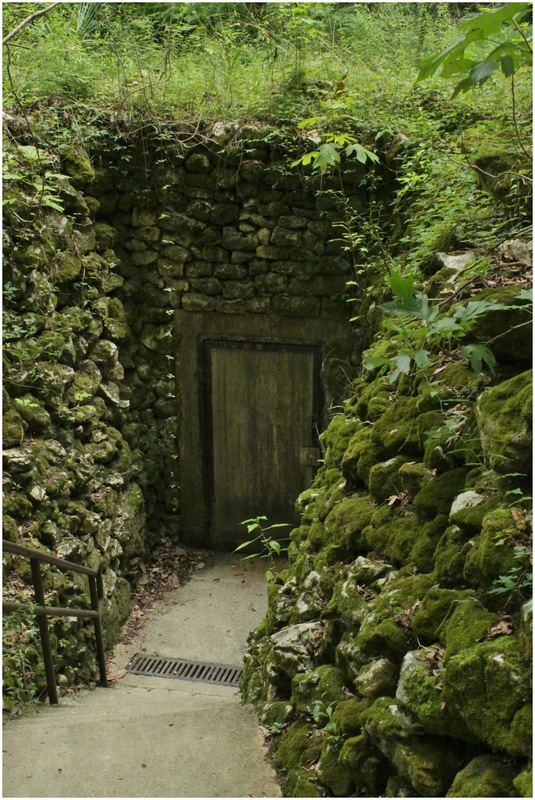 Acidic groundwater dissolved crevices just below the surface, creating cave passages large enough to walk through. 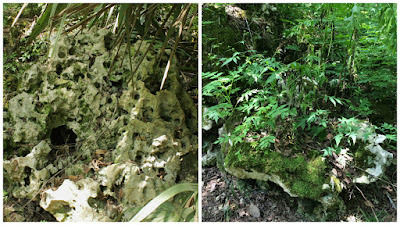 The trail is lined with large limestone boulders and rocks, some of them hosts to plants and trees. Somehow we managed to get off the trail and ended up making the hike a bit more strenuous than it needed to be. Nancy lost her footing at one point and did a little slipping and sliding, so we both came away with some scraps and bruises - always means it was a good hike. Next up is Hope Hull, AL. Just a little south of Montgomery. ~ Still keeping our cool! With the temperatures in the high 90's and even into the 100's it has been a struggle to keep cool some days. As stated before RV's are not insulated the best and with everyone wanting to use their satellite TV's and disks, it is hard to find a campground with trees for shade. Even with the AC running it can still get warm, so we invested in a few small fans to help circulate the air. One sits on the dashboard, one on the dining table, and one on the dresser in the bedroom. It has made a world of difference in the temps inside the RV.